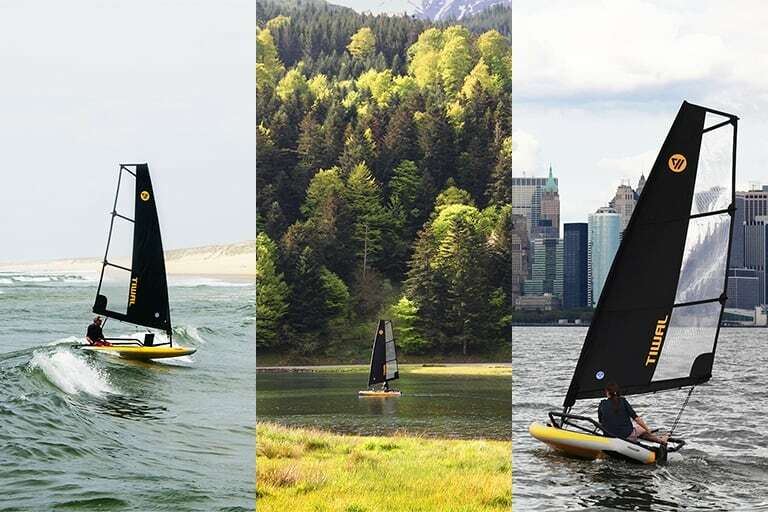 With the Tiwal 3, you will sail (almost) everywhere, at sea, inland, on lakes or rivers. It will be in its element in quiet, rippled and even in waves, with a daring captain. From the mountain lakes of Peru to the Bodensee in Germany or the Palawan Island in the Philippines, will you follow you Tiwal 3? 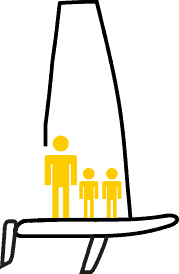 The entire family can sail with the Tiwal 3. Adults, solo or double handed, will enjoy the adrenaline rush when there is wind. 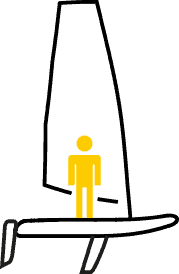 Beginners are reassured by how easy it is to use. Experienced skippers will love its reactivity in all weathers. 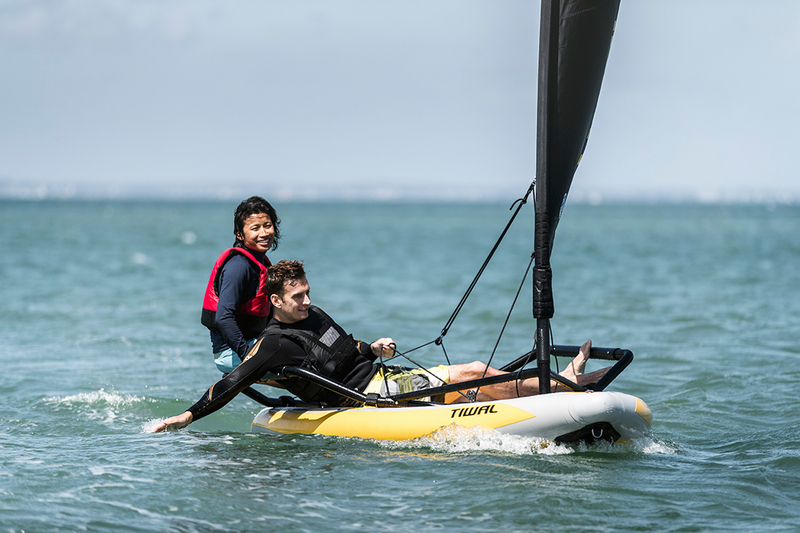 Children will enjoy sailing alone in lighter conditions or can learn with their parents. The Tiwal 3 is so accessible it can be used to learn to sail. Young captains or old salts, your Tiwal 3 can carry up to 200 kg on board. The Tiwal 3 is first and foremost a real boat. It reacts like a larger boat, for maximum pleasure. It sails well upwind thanks to its large centerboard and V-shaped hull. It is also a real delight downwind with its wide open transom. Hiking out on the wings, experienced skippers will enjoy great sensations near the surface of the water and will appreciate the power of the square mainsail and carbon mast. Because the Tiwal 3 is light (50 kg), it can even plane! The Tiwal 3 is very easy to maneuver. When sailing, there are only two controls: direction and speed. It will surprise you with its astonishing ease of handling: push the tiller and it tacks within its own length. It is very reactive, even in light winds! When the windspeed increases, told on tight to the tiller, the Tiwal 3 will surf on the waves. The Tiwal 3 will bowl you over! When the wind rises, so does the fun. The Tiwal can adapt its sail surface. 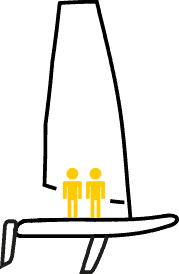 The 7m² sail is powerful, suitable for one or two adults sailing in light to moderate winds. The 5.20 m² sail is more versatile. It works for adults in a strong breeze, and for children in more reasonable weather conditions. Finally, the reefing 7/5 m² sail is good in all weather conditions. 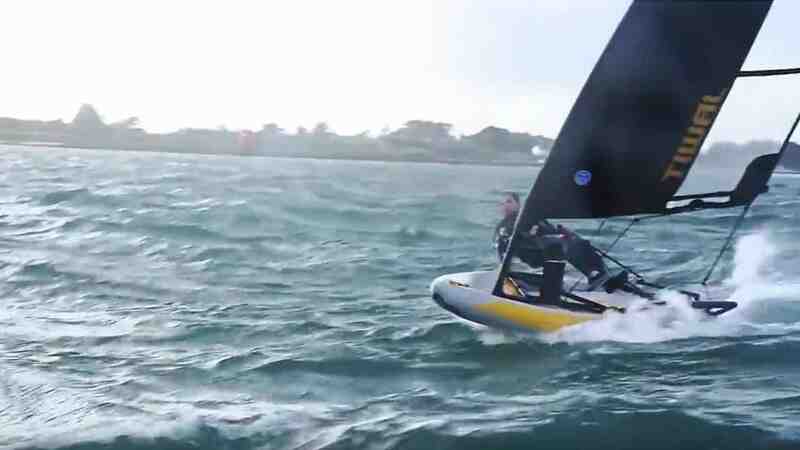 Its surface adapts to the windspeed. Simply stop on a beach to change to an optimal sail surface and fully enjoy the performance of your Tiwal 3, no matter who the crew is. The Tiwal 3 is designed to enable sailors to enjoy maximum sensations on the boat. This includes the comfort of the skipper and crew. The inflatable surface with its foam pad will satisfy the most delicate behinds. 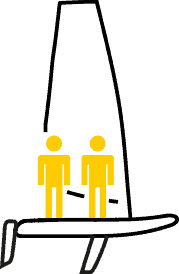 Sailors can lean back on the ergonomic winds or sit on them when the wind increases, to hike out. For complete comfort, wing cushions are available. The Tiwal 3 first and foremost feels very safe. Sailing is reassuring for crew as there is no boom or shrouds. It is also more stable than most classic dinghy. 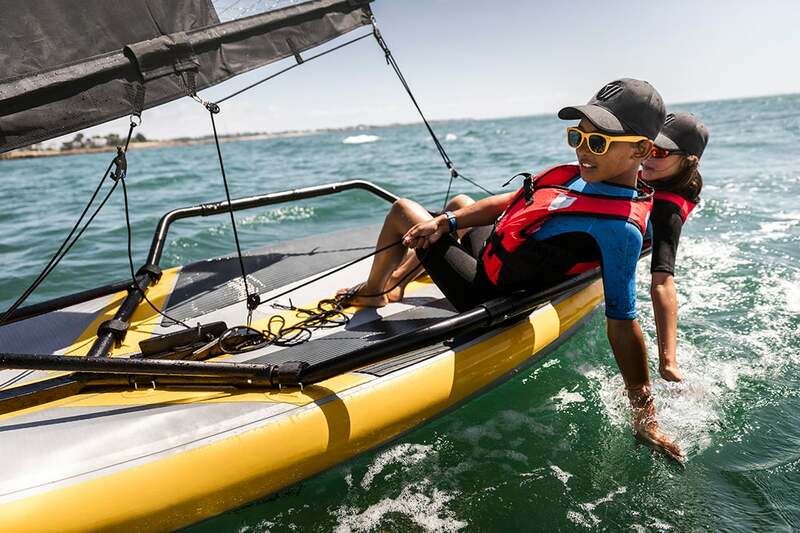 If you capsize, righting it is child’s play. Its open cockpit is self bailing, making it much easier to right. You only need to weigh 50 kg to right the Tiwal 3.